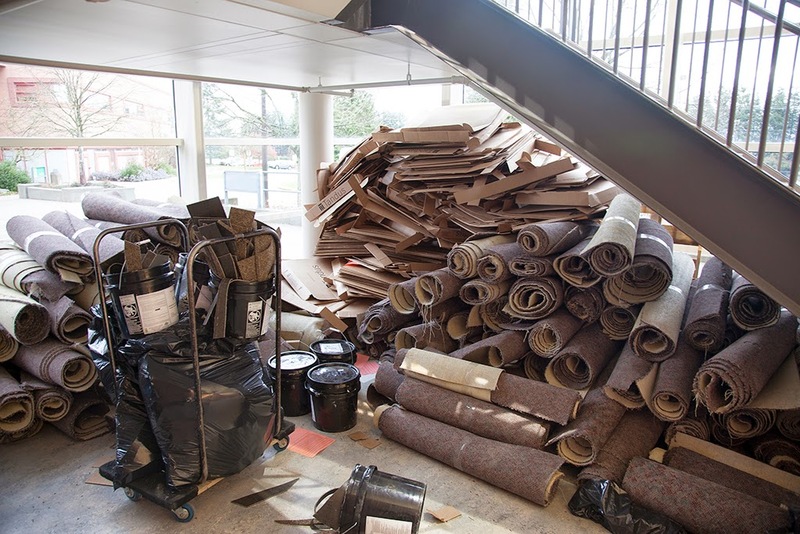 What's New in the UFV Library? 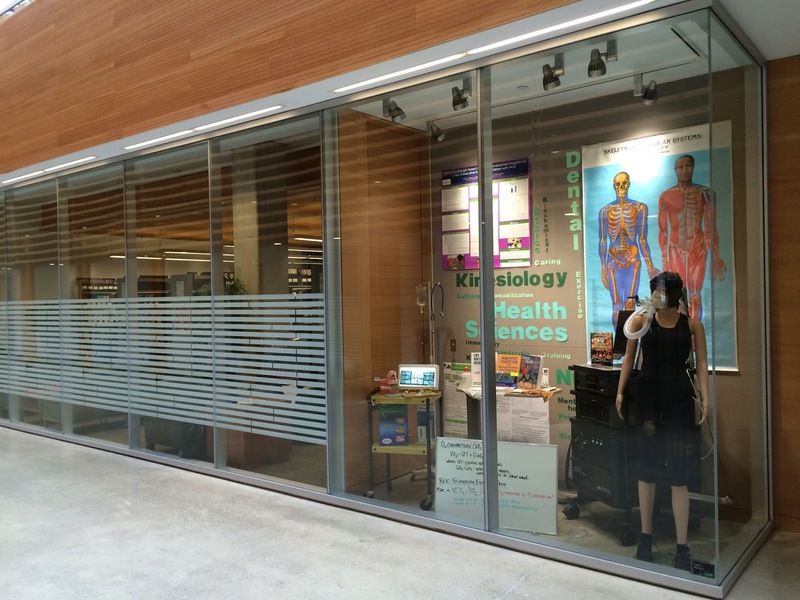 Information about new resources, exhibits, and what's happening in the UFV library. For more information about library hours, click here. Students and faculty interested in researching the history of Canada now have online access to the complete archive of The Canadian Historical Review. 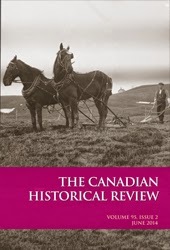 As stated by the University of Toronto Press, "Founded in 1920 as Canada’s national history journal, the Canadian Historical Review focuses on publishing articles and book reviews examining the history of Canada, including imperial, transnational, and comparative perspectives." 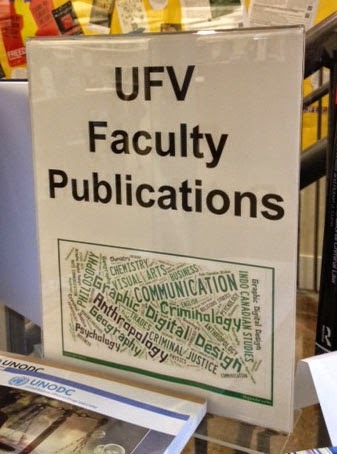 The quickest way to search the content is search for the journal title in the UFV Journals List and then click on the link to the University of Toronto Journals. From there you can search every issue of the journal and access the full text. For more information contact Patti Wilson or Mary-Anne MacDougall. 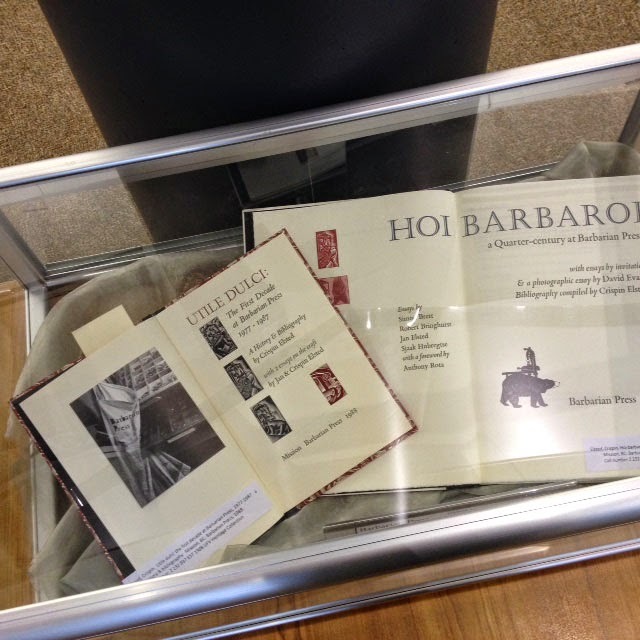 The Abbotsford library is displaying two books from the Barbarian Press collection. A feast for the eyes, and food for the soul, Barbarian Press books are excellent examples of hand printed books, demonstrating exceptional printing and artistic value. UFV Library is fortunate to have the entire catalogue of Barbarian titles in its collection. All titles are catalogued and available to use in the library. Established in 1977 in Kent, England, Jan and Crispin Elsted set up their presses in Mission, BC in 1978 where they have continued their masterful work printing books on English translations of poetry to bibliography, illustrated classics and books on wood engraving. Listen to Crispin Elsted discuss private presses, and specifically William Morris' Kelmscott Press , with UFV's Graphic Design students in 2013. To learn more about the Barbarian Press, click here to access their website. This display will be available until the end of April. and faculty to our inaugural de-stressing day on March 26th from 1-3pm. 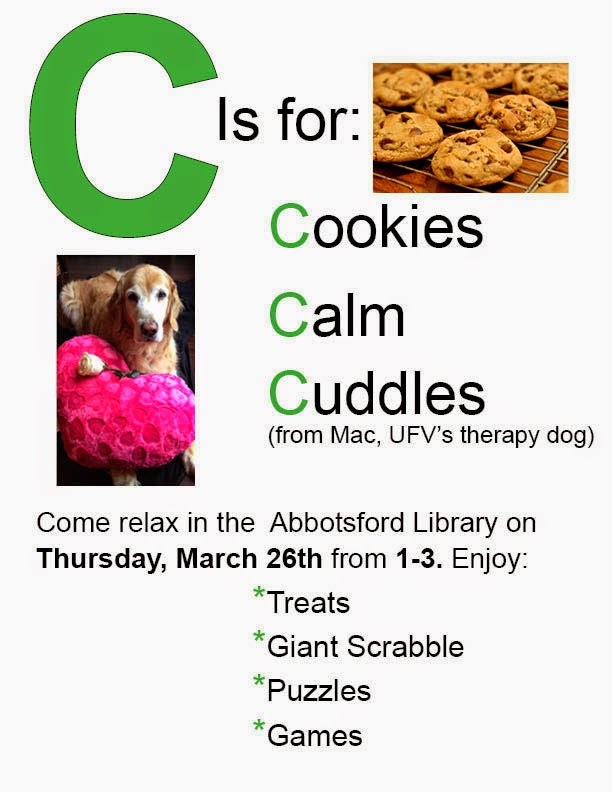 Come in and meet Mac, UFV's therapy dog (who will be providing the cuddles), have a treat and play a game. The library staff will be available to answer your questions or to chat, plus you'll be allowed to eat in the library during this time! We hope to see you on the 26th. Check out the Spring 2015 issue of Library Connections, the library's newsletter. A big thank-you to the Library Connections team who makes this all happen ~ from ideas, to writing, to editing, to layout and design in order to create our final product! Got an idea? We welcome your feedback and ideas for future articles. 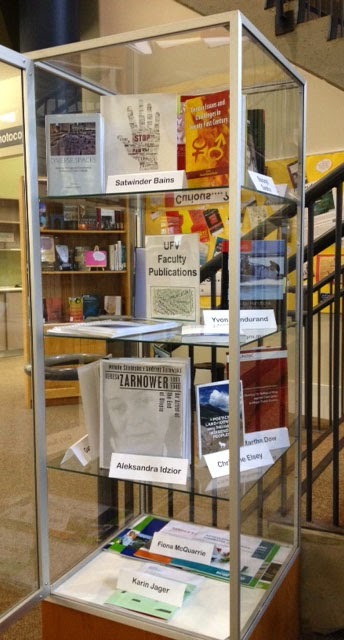 If you weren't able to come by the faculty publication celebration on Tuesday, March 10th, come by the Abbotsford library to see their recently published monographs on display. The library staff are proud of our faculty and are delighted to display the fruits of their research labour. Click here for a list of faculty publications. This display will be available until the end of March. On Thursday, March 12th, printing and photocopying will not be available prior to 9AM on either campus. During this maintenance period, it will also not be possible to add money to your campus card.We apologize for the inconvenience this essential maintenance may cause. © University of the Fraser Valley. Simple theme. Powered by Blogger.